As I write this my little sweetheart is desperately trying to chew on my pen. Since I obviously won’t allow that to happen she redirects her attention to my paper. Oh, how I love my puppy. If you haven’t met my Sadie let me introduce you. 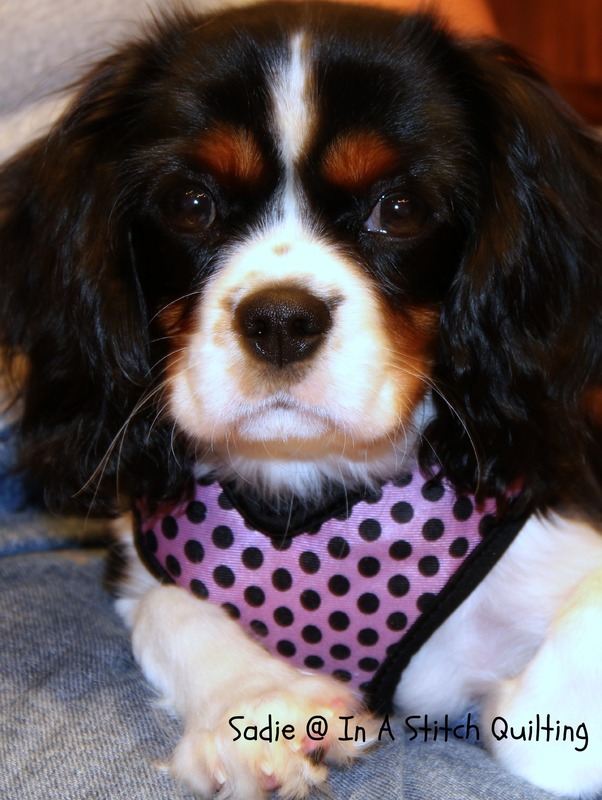 Sadie is an almost five month old Cavalier King Charles puppy. I acquired Sadie last August when she was eight weeks old and weighed just over three pounds. Her entire body, from head to tip of tail could easily fit in your two hands. Today Sadie weights 9.7 pounds. From the moment Sadie walked into our hearts she has outgrown two harnesses, one collar and three beds. Her inventory of toys has grown from the tiny football sent with us by her breeder to a box filled with as varied an inventory as her personality. Sadie first charmed us with a quiet, sweet temperament. Sleeping cuddled within our arms was her favorite place to be. Lucky for me my lap was her number one choice. Of course that’s how things were meant to be. I’m her primary care giver so it’s only natural that I would expect her focused attention. As Sadie grew more comfortable in our home she settled into her very own routine. First of all, I am super pleased that Sadie sleeps all night long in her very own cozy kennel. On the floor of her kennel is a super comfy faux fur cushion. Stretched out flat the cushion would generously cover the entire bottom of the kennel. In fact you could say she has a wall-to-wall, princess sized mattress. Sadie though has her very own way of decorating. Rather than leaving the bed lay flat she would much rather, aggressively paw at the cushion until it’s folded in half. Once folded in half she’s content to settle in for a nap on her self adjusted pillow which now measures nearly four inches thick. Seldom do we hear anything other than the sounds of Sadie repositioning her little body in the kennel. As morning approaches I get dressed and head to Sadie’s room. Sadie sleeps behind the closed-door of our laundry room. Every morning I slide open the pocket door and kneel to peer inside Sadie’s cage. Ninety percent of the time I am greeted by two little, loving, black eyes peering at me from within the kennel. Often times the sentiment of her heart-gripping eyes is reflected by the vigorous wagging of her long thin tail. 1. Sit patiently on the floor outside her kennel. Eventually she joins you in your lap. Sit on the bench, in our back hall, and wait as above. 3. Open the kennel door and walk away. Sooner or later she will make her appearance. Now if Sadie were much older, more trustworthy, less apt to get herself into trouble, I wouldn’t be concerned about monitoring her whereabouts. Because she is prone to mischief I monitor her every move. When not under my careful watch she spends her time in an exercise pen. As soon as Sadie has officially begun her day by leaving her kennel, she and I make a visit outside for a potty break. Often times, when we return inside, she’s allowed to roam our kitchen and dining area while tethered to her sixteen foot lead. Once the exploration period is over she’s placed into her exercise pen where an over-sized super comfy bed awaits her. This brown, terry cloth lined cushion with tan polka dots is typically the first place Sadie heads for. Now mind you, she’s only been out of her kennel for perhaps twenty minutes at this point. The cushion is the last place I would picture her focused on. I would think food and water would be her focus. But, oh no, not Sadie. She’s our little teenager. She would much rather chew on one of her bones or take a nap. Yes, I said take a nap. It is not unusual for Sadie to sleep the morning away in her over-stuffed, warm and comfy dog bed. Breakfast for her might not happen until mid-day. That’s when Sadie begins to perk up and truly start her day. Sadie is our pride and joy. We love having her around and sharing our lives with hers. She’s sweet, at times energetic, generous with her kisses and over all a delightful puppy. We are so thankful she walked into our lives nearly three months ago. I hope you’ve enjoyed reading about my little Sadie as much as I have enjoyed telling her story. I am certain you will be hearing many, many more stories. Take care! < It’s A Zoo In Here!